To commemorate the successful conduct of 9th Asian Games at New Delhi, Govt. of India Released Commemorative 2 Rupee Copper-Nickel coins in the year 1982 for public circulation. These commemorative 2 Rupees coins were released from Mumbai and Kolkata Mint. However in case of coins released from Mumbai Mint we can find interesting obverse and reverse die varieties. These varieties show very minute but easily identifiable variations as detailed in below given images. 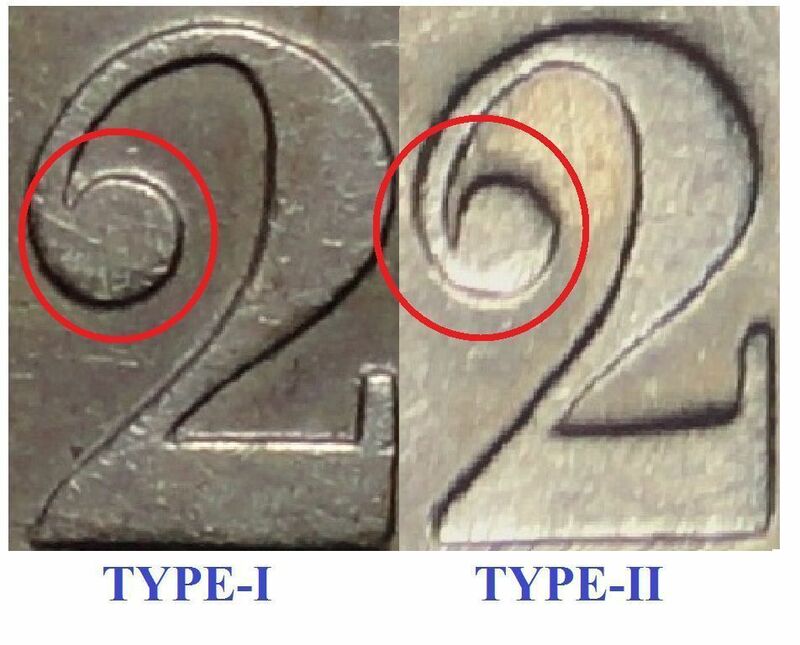 Here we can easily see that in case of Type-I obverse, space between the legend script (INDIA RUPEES & भारत रुपए) and the border is more whereas in case of type-II obverse this space is smaller. Since more space was consumed between legend and the border in Type-I die, there was lesser space available to accommodate the lion capital, so type -I obverse will have smaller Lion Capital whereas type-II will have relatively larger Lion Capital. Additionally, serif of the Devanagari alphabet 'भा' is thicker and shorter in type-I whereas it will be thin and elongated in type-II obverse. There are additional minute differences in font styles of denomination digit '2' please refer the image given below for the details. Similar to the obverse side, reverse side also exhibit differences in the space between legend and the border. Type-I reverse have more space between legend and the border. Its emblem will be smaller due to lesser space available to accommodate it. Whereas type-II reverse will have lesser space between border and the legend hence its emblem was kept larger to adjust more available space. One with large Lion and Large Emblem is relatively scarce but not absolutely scarce. Beautiful clarification about the die varaities & mule coin.